We’d love your help. Let us know what’s wrong with this preview of Woolvs in the Sitee by Margaret Wild. In a mostly abandoned city, Ben lives in a musty basement room, terrified of the "woolvs" that dwell in the shadows outside, with only an upstairs neighbor, Mrs. Radinski, to help him cope with his fears. To ask other readers questions about Woolvs in the Sitee, please sign up. 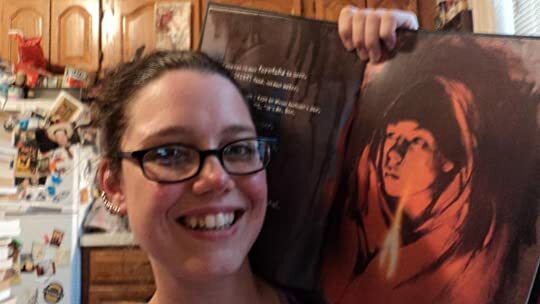 THIS IS A PICTURE OF ME AND THE BOOK CONTAINING MIRIAM'S AVATAR, AS THOUGH WE ARE BEST FRIENDS HANGING OUT IN MY APARTMENT. this book is totally haunting. it is not a typical cut-and-dried children's book; there is no moral, there is no happy ending. i'm not even sure if there is a story here. this is more like a fragment of a larger, unwritten piece that spooks you a little and gives you skull-echoes, and a desire to look over your shoulder. the whole thing is more of a tone-story, with ambiguous happenings and contradicting viewpoints. is it a true apocalypse story?? is the narrator mad?? some things point towards one interpretation, some to t'other. for a picture book with relatively few words, it could potentially lead to hours of discussion. and once i realized it was the same woman who had given the world Fox, it all clicked. the madness!! this woman is awesome! 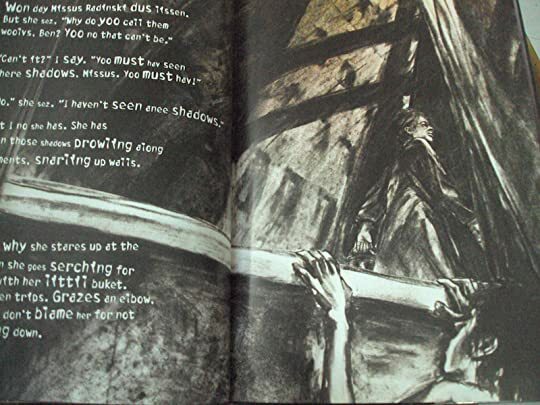 and i know our dear miriam has read a bunch of her other books, and this inspires me to get to the bottom of what makes her (margaret wild) tick, and why she creates such fantastically dark and disorienting children's books. WHAT IS SHE PLANNING?? it makes my brain itch. Ben, the protagonist of this post-apocalyptic picture book, hides from the shadowy wolves in a basement room, burning furniture for warmth and begging the old lady upstairs for water. There is some suggestion, based on Missus Radinski's claims that there are no wolves and Ben should go back to school or get a hobby, that perhaps the little boy is suffering from some mental illness rather than the collapse of civilization. On the other hand, she doesn't seem to see a problem in him living alone in a basement. And eventually she disappears. Is she the one living in a fantasy world? The red skies and broken black buildings certainly look like the products of a real catastrophe. Unless they are in Ben's head and we're seeing from his point of view...? I think I incline towards seeing the devastation as real rather than imaginary because the book reminded me of Russell Hoban's post-apocalyptic novel, Riddley Walker. This has an urban setting rather than a rural one, but I can easily see this as in a continuum with Hoban's work, as if this was the immediate fall-out (Ben recalls blues skies and his family) while Riddley Walker occurs centuries later. In Ben's scrawled narrative we see the decline in spelling and grammar, the made-up vocabulary of a boy who heard words that he didn't understand precisely. In both books the altered language seems very natural. The art is dark and effective, mirroring and sometimes interacting with the text. I may be a little obsessed with Margaret Wild books here lately. I picked up another one the other day due to it's interesting title which is misspelled along with an eerie looking cover. After starting the story I realized that many of the words are misspelled in the book which really adds to the darkness. The story takes place in a post-apocalyptic world and a boy named Ben is stuck in a house with barely any food or water. He's scared of the outside world and believes that there are Woolvs waiting outside to get him. "And soon they will Kum. and for yor bruthers and sisters. yor muthers and fathers. yor arnts and unkils. He lives in an apartment building with an elderly woman named Mrs. Radinski and once saved by her, he now must return the favor and conquer his fears by leaving the building in which he resides to locate her. The misspelled and sketched words along with the black and watercolor illustrations add to the dismalness of the story. Once again, Margaret Wild never ceases to amaze me with her powerful writing. The message this book sends is to be brave and overcome your fears. Never be afraid and take control of your life. This book is best suited for older children 6 grade and up. It's content is too difficult for younger readers. This was an extremely unique book! I read it to my class and they enjoyed it. However, it was hard to read because so many of the words are spelled incorrectly (on purpose). "No." she sez. "I haven't seen anee shadows." Or it could be like a kid wrote it. Either way the illustrations, which occupy the entirety of nearly every page with the text printed over them, are charcoal and ink (it looks like anyway but hell as far as I know it coulda all been done on a computer) in combinations of lines jagged and smeary, but sometimes giving way to large fields of non-representational texture such as water-buckled or aged paper. As for the story I won't say much but that the climax surprised me by striking a moving note which actually did move me a bit, surprising because I rarely feel that with books and because it was done with so little. I'm not a cold person but fiction hardly ever gives me a real inner ping/pang of feeling, not because I'm a tough guy or, again, a cold person, but I guess I'm a cold reader. Bald attempts to move me usually just move my eyeballs in a circular motion but this book is corn free. This is one of the weirdest books I’ve ever read. It’s children’s (children’s?!) picture book. It seems to be a horror book. I think it’s about external horrors, but I kept thinking of agoraphobia and other mental illnesses, and of growing up in a less than ideal situation, and not knowing what was going on is part of its technique, I think. Anyway, it was chilling. It would have terrified me had I read this while a child or teen, especially the years when I was living alone, especially the relat This is one of the weirdest books I’ve ever read. It’s children’s (children’s?!) picture book. It seems to be a horror book. I think it’s about external horrors, but I kept thinking of agoraphobia and other mental illnesses, and of growing up in a less than ideal situation, and not knowing what was going on is part of its technique, I think. Anyway, it was chilling. It would have terrified me had I read this while a child or teen, especially the years when I was living alone, especially the relatively short period when I was in some actual danger. Danger permeates everything about this book and Ben’s narration. Because of the misspellings and dark content (it’s dark no matter how it’s interpreted) I wouldn’t recommend this for anyone under nine and only those who don’t get easily frightened by books’ contents. The art is eerily effective in helping make this book as scary and puzzling as it is. The art is superb as far as it matching the book’s text. Wow! In a way I hated this book, but it’s so unique and I had such a visceral reaction while reading that I have to say I really liked it. Contemplating what Ben is really facing is compelling. And, it’s unlike any other books, especially any short picture books, I’ve ever read. I am going to have to re-read this. Until I read other reviews, I thought the book was "Wolves in the Settee" So I thought the boy writing it was schizophrenic and thought wolves were living in his furniture. It's a totally different story when you think the whole thing is taking place in the dark and twisted imagination of a mentally disturbed person. I'm so embarassed. I had no idea that Sitee was "City" and now it makes MUCH more sense. Short graphic novel set in a post-apocalyptic world which has been taken over by woolvs. A young man tells about his fears and how he survives. His only friend is his upstairs neighbor who doesn't believe him about the woolvs until she runs afoul of them and disappears. The colors are dark and the spelling is creative in this story. The talented team of Margaret Wild and Anne Spudvilas has produced a remarkable picture book that beautifully balances those ubiquitous reviewers’ words, “compelling” and “challenging.” Woolvs in the Sitee, 2007 winner of the Aurealis Award and a CBC Honour Book, is so original and unusual that the publishers have posted a special teaching guide on the book’s website page. But don’t be deterred by classification-slipping noises; Woolvs offers rich rewards for the visually and metaphorically lite The talented team of Margaret Wild and Anne Spudvilas has produced a remarkable picture book that beautifully balances those ubiquitous reviewers’ words, “compelling” and “challenging.” Woolvs in the Sitee, 2007 winner of the Aurealis Award and a CBC Honour Book, is so original and unusual that the publishers have posted a special teaching guide on the book’s website page. But don’t be deterred by classification-slipping noises; Woolvs offers rich rewards for the visually and metaphorically literate young reader. Only for well-established writers and illustrators like Wild and Spudvilas do publishers risk such nervy work. For the emerging adolescent who is realizing that life is not just what it appears to be, Woolvs in the Sitee will be embraced as a book that respectfully articulates the dark passages in one boy’s journey of emerging selfhood. [This review originally appeared at www.papertigers.org. Written by one of Australia's leading picture book writers, Margaret Wild, Woolvs in the Sitee is a dystopian picture book about a boy named Ben who shares his story of living in a dark, frightening world where his only help comes from a neighbor, Mrs. Radinski. The book is written from Ben's point of view, with words written out phonetically, and he shares his immense fear of wolves and his dream of seeing a real blue summer sky. The text is formatted in a frantic manner, and the pictures are a Written by one of Australia's leading picture book writers, Margaret Wild, Woolvs in the Sitee is a dystopian picture book about a boy named Ben who shares his story of living in a dark, frightening world where his only help comes from a neighbor, Mrs. Radinski. The book is written from Ben's point of view, with words written out phonetically, and he shares his immense fear of wolves and his dream of seeing a real blue summer sky. The text is formatted in a frantic manner, and the pictures are almost scribbled on the page--like it's a page out of Ben's diary and he's writing quickly to get his thoughts on paper before someone or something finds him. A very strange book! It seems to take place in an apocalyptic world, possibly an environmental catastrophe (his longing for blue sky), in a sparsely populated city. Given his poor spelling, one can judge that civilization broke down a number of years ago, before he had had enough schooling to learn how to spell properly. The nature of the "woolvs" is never made clear, though the boy's fear of them is palpable. The illustrations, largely in black, gray, and red, added to the sense of doom and fea A very strange book! It seems to take place in an apocalyptic world, possibly an environmental catastrophe (his longing for blue sky), in a sparsely populated city. Given his poor spelling, one can judge that civilization broke down a number of years ago, before he had had enough schooling to learn how to spell properly. The nature of the "woolvs" is never made clear, though the boy's fear of them is palpable. The illustrations, largely in black, gray, and red, added to the sense of doom and fear. This story would make a good jumping-off point for discussion or for a creative writing prequel (how did he get to this point?). This is one of the most beautiful and eerie and haunting books that I've ever read. Misspelled as though a child has written this, Woolvs in the Sitee depicts either a traumatic dystopia or perhaps a heterotopic world through a paranoid lens. Either way, the ambiguity is utterly amazing, and I think that this book is one that absolutely elevates the notion of what children's literature is as an art form. With dark, jerky illustrations, this becomes a well-rounded book that plays on fears, bel This is one of the most beautiful and eerie and haunting books that I've ever read. Misspelled as though a child has written this, Woolvs in the Sitee depicts either a traumatic dystopia or perhaps a heterotopic world through a paranoid lens. Either way, the ambiguity is utterly amazing, and I think that this book is one that absolutely elevates the notion of what children's literature is as an art form. With dark, jerky illustrations, this becomes a well-rounded book that plays on fears, belief, strength, and denial. Though I typically give age ranges on my book reviews (a problematic aspect, perhaps? ), I can certainly say that I believe this is great for all ages. Some may disagree on account of the content, but it's ultimately an engaging and creative book that does its best to encapsulate the mind of a young boy in a world unlike our own. Oh my. Dark. Twisted. LOVE IT. Actually, I hated it. But I hated it so much that I love it. What an interesting, thought provoking book. So much potential for discussion. And the spelling! 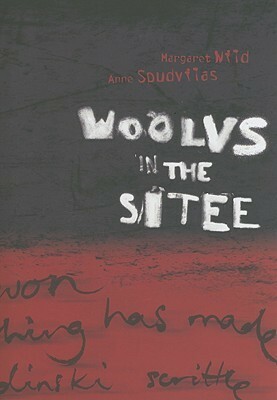 'Woolvs in the Sitee' is not a children's picture book but rather a graphic short story, more suitable for older teens. The story and the ideas underlying it make it a challenging book. From the beginning, the reader knows that something is wrong. The rough wolf image and the strong, graffiti-like writing act like a warning. The central character, Ben, has withdrawn from the world; he is alienated and full of fears. He is terrified of the 'woolvs' but determined to find his neighbour. To do so, 'Woolvs in the Sitee' is not a children's picture book but rather a graphic short story, more suitable for older teens. The story and the ideas underlying it make it a challenging book. From the beginning, the reader knows that something is wrong. The rough wolf image and the strong, graffiti-like writing act like a warning. The central character, Ben, has withdrawn from the world; he is alienated and full of fears. He is terrified of the 'woolvs' but determined to find his neighbour. To do so, he needs to be strong and find the courage to overcome his fear of going out. Visually unique and stylistically engaging, Woolvs in the Sitee defies easy categorization as it paints a picture of one boy's experience with fear, abandonment, and resilience in a world he does not recognize. Woolvs in the Sitee had lovely drawings. It was also an intriguing story with an open ending. Wow, that was something. Bit creepy, definitely unsettling, unlike any picture book I’ve read before. As I was browsing the Teen Graphic Novel section (the only place graphic novels aren’t dispersed into the stacks) Margaret Wild & Anne Spudvilas’ picture book caught my eye. Woolvs in the Sittee‘s cover is intriguingly creepy; and my mind went immediately to Dave McKean. The jacket copy drew me in deeper, though afterward I found it forgivably misleading for the most part. What is actually going on in Woolvs in the Sitee is not transparent. In a way, the paranoia of the protagonist Ben could As I was browsing the Teen Graphic Novel section (the only place graphic novels aren’t dispersed into the stacks) Margaret Wild & Anne Spudvilas’ picture book caught my eye. Woolvs in the Sittee‘s cover is intriguingly creepy; and my mind went immediately to Dave McKean. The jacket copy drew me in deeper, though afterward I found it forgivably misleading for the most part. What is actually going on in Woolvs in the Sitee is not transparent. In a way, the paranoia of the protagonist Ben could have sketched the hostile environment, imagined these Woolvs that “spare no won.” Ben’s only neighbor Mussus Radinski thinks he should get out more, go to school. But as Ben observes, even Radinski “stares up at the sky wen she goes serching for water with her littil buket. She offen trips. Grazes an elbow. a nee. I don’t blame her for not looking down.” Maybe it is Missus Ridinski who is “scrooching down” into her delusions. After Ben is lured outside and into a harrowing moment, there is little doubt on anyone’s part that the Woolvs are real; though who they are is another matter. And what they’ve done, still another. 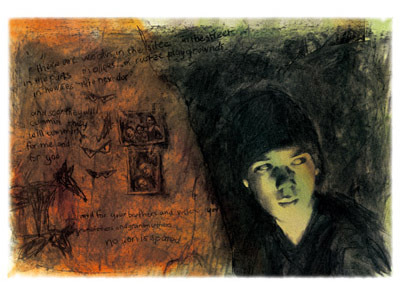 The situation is creepy, and the font, the phonetic spelling by the narrator Ben, the charcoal (slashing in the background, fluid and real with the characters), the colors used and how applied, the perspectives in the composition of each illustration… Wild and Spudvilas truly capture the atmospheric and set the reader on an edge. “Spudvilas’s rough charcoal sketches of deserted streets and vacant interiors slash the full-bleed spreads, and watercolor washes of sour yellow, blood red and toxic green imply apocalypse.”~Publisher’s Weekly. Whether the story will find success with the Reader is left to the Reader. The ending was strange and somewhat abrupt, certainly more open-ended than I expected. Publisher’s Weekly observes: Woolves in the Sitee ”reads more as a prequel to a thriller than as a tale in its own right.” Is this where the “challenging” part of the jacket copy’s assertion comes in? What does the unsettling aspects of the story provoke–to include ending it as it does? I can say it is well-rendered, and it’s a nice creepy little read. And it may be a delicious little writing prompt; may be you decide to “joyn” Ben; may be you’ve a beginning of your own. Woah. Intense. First of all, this is not a picture book for little kids. At least, not for them to read on their own. This could cause some serious nightmares, or at least some serious questions about how safe they are in the world. The story is set in an unknown 20th or 21st century city. A teen boy, Ben, won't leave his home, because he knows the woolvs are waiting for him. The entire story is told with fine grammar, but atrocious spelling, but the spelling makes sense. If you are trapped insid Woah. Intense. First of all, this is not a picture book for little kids. At least, not for them to read on their own. This could cause some serious nightmares, or at least some serious questions about how safe they are in the world. The story is set in an unknown 20th or 21st century city. A teen boy, Ben, won't leave his home, because he knows the woolvs are waiting for him. The entire story is told with fine grammar, but atrocious spelling, but the spelling makes sense. If you are trapped inside your home during your developmental years, out of contact with most of humanity, niceties like "spelling" are probably nto high on your priorities. Ben's neighbor, Mrs. Radinski, makes occasional forays for water, but even she is wary of the outside. And then she disappears. The book ends on a not necessarily uplifting note, but a foreward-moving one. Ben leaves his home to find Mrs. Ridinski. Will he? Or will he be caught by the woolvs? I've seen speculation that the sitee is actually in Nazi Germany, and there's certainly some evidence to support that, but it's never made so overt that this could only be about the Nazis. It could just as well be set in the bombing of Afghanistan, or in some future post-apocalyptic world. Wit how vague things are, I think this could be a great book to use in a high school English lit class, to teach students how to make an argument about a text. Woolvs in the Sitee by Margaret Wild and Anne Spudvilas was an unusual book that challenged my thoughts. The book is about a boy named Ben who has a fear of the “woolvs”. It is not clear what the “woolvs” are representing, but it is apparent that Ben has a big fear. Ben ventures outside of his building one day to find the blue sky but gets haunted by the “woolvs”. His neighbor Missus Radinski rescues him and brings him back inside. Missus Radinski does not believe in the “woolvs” and soon it is Woolvs in the Sitee by Margaret Wild and Anne Spudvilas was an unusual book that challenged my thoughts. The book is about a boy named Ben who has a fear of the “woolvs”. It is not clear what the “woolvs” are representing, but it is apparent that Ben has a big fear. Ben ventures outside of his building one day to find the blue sky but gets haunted by the “woolvs”. His neighbor Missus Radinski rescues him and brings him back inside. Missus Radinski does not believe in the “woolvs” and soon it is too late for her. This book made me think that Ben had some type of schizophrenia. I pictured this causing his fear. After researching the meaning and reviews of this book I found that it can be interpreted in many ways. Whether it is hinting at a disorder, homelessness or some type of holocaust, the fear is the underlying message. The spelling made me have to read slower in order to comprehend and this challenged me. I did not think this book was terrible, but at the same time I did not find it enjoyable. The book is different and gave me a good understanding of a picture book. The pictures were dark and dramatic. It put me in an eerie mood while reading the text which is spelled phonetically. From researching the authors, I found that Margaret Wild is an Australian author who is known for exploring a diverse range of themes such as issues of identity, trust, and death. Anne Spudvilas is also from Australia who is a well known artist and illustrator. Well, this book is quite a different one, let’s start with that. It’s a picture book, but not like your average No, David or Bark, George. No no no. This is one for a mature audience, around 12 or older, and it is dark. Very dark. The book centers on Ben, a young boy all alone in a bleak and terrifying world. He spends his days and nights hiding in a basement only looking out at what’s left of his former city. His only companion is his neighbor, Mrs. Radinski, who takes as good of care of him as Well, this book is quite a different one, let’s start with that. It’s a picture book, but not like your average No, David or Bark, George. No no no. This is one for a mature audience, around 12 or older, and it is dark. Very dark. The book centers on Ben, a young boy all alone in a bleak and terrifying world. He spends his days and nights hiding in a basement only looking out at what’s left of his former city. His only companion is his neighbor, Mrs. Radinski, who takes as good of care of him as she can. Ben warns Mrs. Radinski about the “woolvs” that haunt the city, but she doesn’t believe him. Until it is (possibly) too late for her. The entire book is written in misspelled English which is apparently Ben’s own writing (it looks like he may be writing this account on his walls or some scrap paper). In some parts I really had to sit and look and sound out the word to figure out what he meant, like “fernicha.” But I do think Wild did an excellent job phonetically spelling words the way a barely educated young boy would. To be honest, this wasn’t my favorite book of recent memory. But to be more honest, I don’t gravitate toward dark books in general. 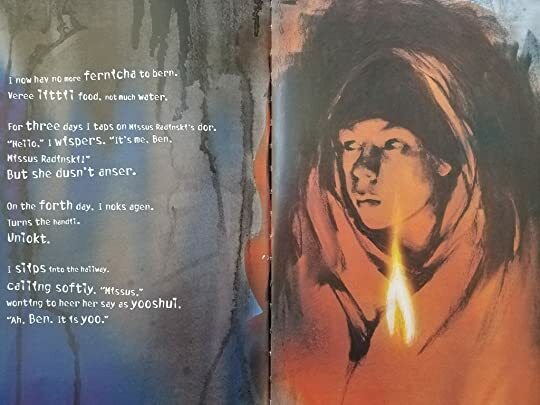 I will say the artwork captures the fear and darkness of Ben’s world and really gives the book a “mood.” I appreciated the idea of the book, and I think it can give young readers something to think about with our own world and the politics and dangers around us. This is an intense picture book with themes and issues relating to all ages. We are studying this picture book and its literary devices in the upper primary stage. This is a story written by Australian author Margaret Wild and illustrated by Anne Spudvilas - it is set in World War 2 when ghettos were established and there was a constant threat that the Germans (the wolves) were watching and waiting to take the Jews away. There are clues given throughout the book that point to this setting - the This is an intense picture book with themes and issues relating to all ages. We are studying this picture book and its literary devices in the upper primary stage. This is a story written by Australian author Margaret Wild and illustrated by Anne Spudvilas - it is set in World War 2 when ghettos were established and there was a constant threat that the Germans (the wolves) were watching and waiting to take the Jews away. There are clues given throughout the book that point to this setting - the barbwire fencing, the apartments with no water or power, the name Radinski, even the reference to the painted wall of blue sky that tricks the boy out of hiding. The boy (Ben) has been separated from his family and is hiding in a basement of types, underneath a Mrs Radinski who gives him water and looks after him (covering him in a blanket and taking him back to the apartment). She is one day taken herself. Unfortunately some of the other reviewers have missed the many issues embedded within this text completely - the text is large but grossly mispelt because Ben has had only a small amount of education or not at all. It is not that way to target younger readers. The visual literacy within this book is stunning, with the use of dark colours and mix of sketch and watercolour stain commanding 110% attention of the reader. I highly recommend this picture book to both mature children and adults alike. Woolvs in the Sitee was a very unusual book. I thought that after the first few pages the book might explain itself but it never did so I was confused through out it. Ben is the main character in the book and he is terrified of the "woolvs" but the author never tells you what the "woolvs" are. The author not telling the reader what the "woolvs" are kind of intrigued me because you can use your imagination and make out the "woolvs" to be anything that you want them to be. I really disliked that e Woolvs in the Sitee was a very unusual book. I thought that after the first few pages the book might explain itself but it never did so I was confused through out it. Ben is the main character in the book and he is terrified of the "woolvs" but the author never tells you what the "woolvs" are. The author not telling the reader what the "woolvs" are kind of intrigued me because you can use your imagination and make out the "woolvs" to be anything that you want them to be. I really disliked that everything was spelled phonemically because I would find myself having read an entire page but been so focused on the words that I had no idea what I read and would have to re-read the page. Wow - It's frightening, disturbing, dark, and amazing! A dystopian look at a post-apocalyptic world, this amazing picture book from this Australian author and illustrator evokes the desperation and fear of Ben, the narrator of the text. There are woolvs in the sitee. Oh, yes! In the streets. In the parks. In the allees. In shops. in rustee playgrounds. in howses rite next dor. yor mu Wow - It's frightening, disturbing, dark, and amazing! A dystopian look at a post-apocalyptic world, this amazing picture book from this Australian author and illustrator evokes the desperation and fear of Ben, the narrator of the text. This is a singular book. In the library, it is located with the children's illustrated books, but I am not sure that it belongs there. I think that this would be a very difficult book for the children usually targeted by picture books. For one thing, many of the words are spelled phonetically, which would be confusing for someone still learning to read. Also, the story has a post-apocalyptic setting, and the artwork is moody and eerie. It's sort of scary, and it never answers any of the question This is a singular book. In the library, it is located with the children's illustrated books, but I am not sure that it belongs there. I think that this would be a very difficult book for the children usually targeted by picture books. For one thing, many of the words are spelled phonetically, which would be confusing for someone still learning to read. Also, the story has a post-apocalyptic setting, and the artwork is moody and eerie. It's sort of scary, and it never answers any of the questions that it raises. What (or who) are the woolvs? What happened to his neighbor? Why is he all alone? A totally bizarre dystopian short story with vivid illustrations. The narrator writes phonetically - for example "Erly won morning, wen I'm squinching owt the window,I sees a bloo sky!". I enjoyed its subtext of apocalypse and conspiracy (the narrator, Ben, insists that there are "woolvs" taking over the "sitee" and that they will come for everyone and spare no one - but nobody else will listen to him or believe him). Someone could probably write a dissertation about this kind of picture book (w A totally bizarre dystopian short story with vivid illustrations. The narrator writes phonetically - for example "Erly won morning, wen I'm squinching owt the window,I sees a bloo sky!". I enjoyed its subtext of apocalypse and conspiracy (the narrator, Ben, insists that there are "woolvs" taking over the "sitee" and that they will come for everyone and spare no one - but nobody else will listen to him or believe him). Margaret Wild has written more than seventy books and has been published around the world. Her numerous awards and distinctions include the Children’s Book Council of Australia Picture Book of the Year Award for Jenny Angel, illustrated by Anne Spudvilas; The Very Best of Friends, illustrated by Julie Vivas; and Fox, illustrated by Ron Brooks. In 2008 she received the Nan Chauncy Award for an outs Margaret Wild has written more than seventy books and has been published around the world. Her numerous awards and distinctions include the Children’s Book Council of Australia Picture Book of the Year Award for Jenny Angel, illustrated by Anne Spudvilas; The Very Best of Friends, illustrated by Julie Vivas; and Fox, illustrated by Ron Brooks. In 2008 she received the Nan Chauncy Award for an outstanding contribution to children’s literature in Australia. A Bit of Company and Going Home, illustrated by Wayne Harris, were published in 2009 by Walker Books Australia as part of the Walker Classic series. Margaret Wild was the winner of the 2011 Lady Cutler Award. “There are woolvs in the sitee. Oh, yes!